Q: What is included with the Paella? A: Paella includes a tossed green salad, balsamic vinaigrette dressing, dinner rolls with butter chips. all (standard) disposable plates, napkins and eating utensils. Q: Can I use my own rented silveware, china or disposable plates I purchased instead of the ones you provide? A. Absolutely! 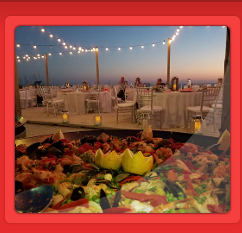 We provide our disposable plates, napkins and eating utensils at no extra cost to you but, You can always use your own, rented or purchased dinnerware at your event. Q: At what time will you arrive to prepare the paella? 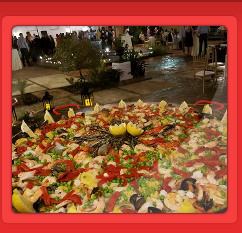 A: Time of arrival is determined by size of event, location, travel time and the time you would like paella ready for serving. Normally between 2 to 3 hours before serve time. Q: What time will the paella be served? 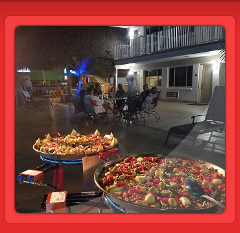 A: Senor Pepe's Paella Catering service is commited to serve all guests at the scheduled time agreed upon as per contract. Should unforseen circumstances arise, Senor Pepe's Paella catering staff will transfer food into disposable trays and leave food at venue. Q: If I need you to stay longer at the event is there an additional charge? Q: Do you charge more if we want to be served late in the day? A: We always try to work with your schedule. depending how late, and location, it may require that we make special arrangements (additional charge) and book a room for that evening. A: Staff is provided based on size of event. Staff will asisst chef with initial set up, assist chef serving paella at work station and breakdown of paella equipment when time of service is over. Q: Do you provide canopy, tent, tables, chairs or outdoor furniture to rent for our guest? A: Because we travel throughout the state, we do not provide canopy, tent, table, chair or outdoor furniture rental service. This service can be provided by many local vendors in your area. A: We travel as far south as Key West and up to 180 miles north of Naples, Florida and coast to coast surrounding areas. We can travel further north with special arrangements that may have additional requirements. Q: What are the special arrangements and additional requirements when traveling? A: Depending on location and distance we may need to make special arrangements and book a room (additional charge) for one night at a hotel. Q: Are there additional charges for out of area events? A: Yes, catered events over 50 miles from our local service area are charged a fee (to cover fuel) This fee is determined based on location, distance and travel time. A: Dates are limited especially during peak season. Holidays are extremely busy and most are booked early throughout the year. We recommend to book and secure your event as soon as you know the date. Q: How do I secure the date? A: Securing the date is simple. Once you have your date, we can generate an invoice with the basic information. A (non-refundable) deposit will secure your date. We gladly accept Visa, Master Card, American Express & Discover cards. We also accept business and personal checks. A: The deposit is determined by the size of your event. Deposit start at $150.00 and can be higher depending on the size of your event. Q: Do I lose my deposit if I cancel? A: Unfortunately yes. Deposit and all monies received are non refundable. Your reservation secured the date that was available for potential customers. Q: When do I pay the remaining balance for my event? A: If you paid your (deposit) with a credit card, invoices with a balance of $500.00 or less can be paid on or before date of the event. Invoices greater than $500.00 full balance due must be paid 30 days prior to date of the event. Q: Do you charge extra for working on Holidays? 1) December 24th Christmas Eve. 2) December 25th Christmas Day. 3) December 31st New Years eve. 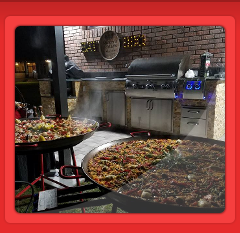 Señor Pepe's Paella Catering LLC.